Some games are designed to be played specifically with keyboard and mouse. Others are designed to be played with a PC joystick. For this reason, it is preferable to buy a good PC joystick, suitable for playing titles optimized for this type of device. In addition, some models are also compatible with various consoles, such as Xbox One and PS4. The choice of our new PC gaming controller must be weighted, as it is a key component of our configuration. Let’s see which PC controller to buy and how to choose the perfect model for our needs. Features such as ergonomics and materials, are crucial in the purchase of our device. Moreover, there are also some purely personal secondary characteristics, which will affect our final choice. So let’s see what aspects and characteristics to consider when deciding which PC joystick to buy. One of the fundamental aspects is ergonomics. A PC joystick must be comfortable to hold, so as not to tire the grip, getting the maximum performance in play. Ergonomics is a feature that depends on our needs. The various PC joysticks have different shapes from each other. Many of them are inspired by the forms of the console controllers of Microsoft and Sony. In addition, the materials used to make the product distinguish a low-end product from a high-end product. By purchasing a low-end PC joystick, we will have cheaper materials, with a high probability that they will be more easily damaged. Wired or wireless PC joystick? Even in this case, the choice is purely personal. Obviously, a wireless PC joystick is more practical and convenient to use, as it does not have a cable that can easily get tangled. The wired models are not limited by a battery that can easily be discharged after years of use. Obviously, when you decide to opt for a wireless solution, you must also take into account the autonomy that is able to guarantee the battery during the hours of play. Compatible with Steam games, Raspberry Pi, X-input/D-input Games. This is a low-end wired model, characterized by a design inspired by Sony’s home console controllers. The materials with which it is made are of good quality, as well as ergonomics. It is compatible with both PC and PS3 console. There is no need to download any drivers, as it is automatically recognized as a compatible controller. This is a very good Logitech wired PC joystick. It has been available for a few years, but continues to be one of the most popular products thanks to the excellent quality / price ratio. It is characterized by a very compact design, which is able to guarantee good ergonomics, especially for those with small hands. A wireless variant is also available, namely the Logitech GamePad F710. This is the joystick in the wired version of the famous Xbox 360. It is made with good quality, allowing a great grip for those who prefer the shapes of Microsoft home controllers. Thanks to the position of the analog sticks, this controller is particularly suitable for a shooter, such as FPS and TPS. 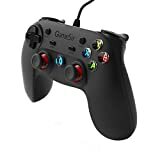 This is not a high-level controller, and its look is certainly not the best, but this product will amaze, thanks to the very affordable price. This is another Microsoft home device. This time it is the model dedicated to Xbox One. In addition to improvements mainly related to design, the triggers and the directional pad have been improved. Furthermore, compatibility with Windows PC is assured. However, it is a fairly large product. So those with small hands may find it inconvenient to hold. A wireless version is also available, with an adapter to be purchased separately. This is a wireless PC joystick made by the famous SteelSeries company. Made with a different design than previous models, ensures good ergonomics and a good grip, not tiring during the sessions of play. The integrated battery allows you to reach 40 hours of play. Thanks to the special software developed directly by SteelSeries, we can modify the sensitivity of the controller as we wish. Moreover, besides being compatible with Windows, we can also use it with Android smartphones, Oculus Rift, HTC Vive and Gear VR. This is a wired joystick designed specifically for PS4, but also perfectly compatible with PC. It is equipped with two different types of customizable analog sticks: one concave and one convex. There is also a 3m USB Type-C cable for maximum accuracy and responsiveness. The back is characterized by 4 shortcut keys easily and conveniently accessible at any time. You can adjust the weight of the controller to best fit our needs. Moreover, thanks to the dedicated Nacon software, we can achieve maximum customization and compatibility with Windows. It is one of the best wireless joysticks made by Microsoft. Compared to the base controller, it has the highest quality interchangeable sticks and D-pads made of metal. Furthermore, extensions can be applied to the buttons on the back of the controller, so that they can be easily reached in any situation. The materials used are of excellent quality, and the handle is comfortable even during long intensive gaming sessions. Also for this model is available for a dedicated software, for Xbox One and Windows, which allows you to apply custom settings for each game. It is undoubtedly one of the best PC joystick available on the market today. It is a concentrate of pure power, enclosed in a controller that incorporates the design of the models for Xbox One. It is equipped with interchangeable levers and D-pads, allowing you to choose between different models for shape and height. It is also equipped with 2 backbuttons and 4 triggers, for a total of 6 buttons that you can remap to your liking. There is also a quick control panel and an input for the 3.5 mm jack. Could Razer’s RGB Chroma lighting fail? Obviously not! 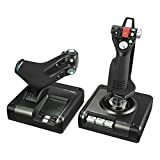 1 Thrustmaster T-Flight Hotas X Flight Stick 1,912 Reviews $54.99 See Offers! 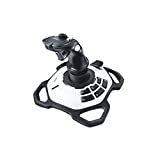 2 Extreme 3D Pro Joystick for Windows 2,069 Reviews $39.99 $34.99 See Offers! 3 Thrustmaster T16000M FCS Flight Pack 84 Reviews $229.99 $171.99 See Offers! 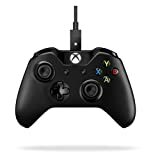 4 PC Joystick, YF2009 USB Gaming Controller with Vibration Feedback and Throttle, Wired Flight Stick... 76 Reviews $69.99 $49.99 See Offers! 5 Thrustmaster T16000M FCS HOTAS 459 Reviews $149.99 $129.99 See Offers! 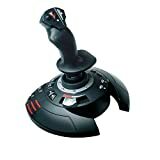 6 Thrustmaster T-Flight Stick X PS3 321 Reviews $39.99 See Offers! 7 Thrustmaster USB Joystick 201 Reviews $24.99 $21.06 See Offers! 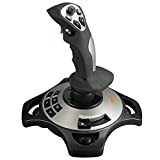 8 Logitech G Saitek X52 Flight Control System 115 Reviews $149.99 See Offers! 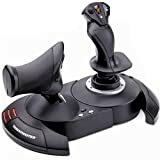 9 Logitech G Saitek X52 Pro Flight Contol System 99 Reviews $199.99 See Offers! 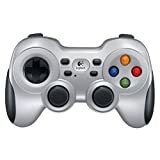 10 Logitech Extreme 3D PRO Joystick 6 Reviews $47.24 $37.00 See Offers!